When it comes to track maintenance, transit systems are looking to accomplish specific tasks easier, better, faster and safer. Whether transit agencies are looking to procure equipment, or hire a contractor, the evolution of track maintenance technologies and services have made it possible to do certain tasks in less time, while keeping workers out of harm’s way. METRO Magazine talked with two companies, Plasser American Corp. and Herzog Transit Systems Inc. (HTSI) to discuss their companies’ equipment and services. Plasser American is a Chesapeake, Va.-based manufacturer of equipment for freight railroads and transit systems. The company works very closely with its transit and commuter customers to accommodate their specific needs in track maintenance equipment. Track maintenance machines have become technologically advanced with PLC control systems and on-board monitoring and diagnostic systems, according to Plasser American. Some machines are equipped with features that allow the machine to work automatically with the operator overseeing its functions as well as being able to intervene if needed, according to Plasser officials. 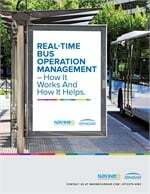 Transit systems are looking for mechanized ways to do things more efficiently. The Switch and Production Tamping Machine is an excellent example of maintenance equipment that helps users get the job done more efficiently. It tamps the track, lifts and lines the track, works on plain track in production mode and can work in switches. Some of Plasser’s tamping machines are equipped with a third rail lifting device, which in the switch it lifts the turnout rail as it tamps through the switch. By automating this process, workers avoid having to go through the cumbersome job of using track jacks under the track and cleaning out the ballast to get the jack underneath. All track is subject to settling due to traffic loads. This settling occurs irregularly and uncontrolled, resulting in track deterioration. 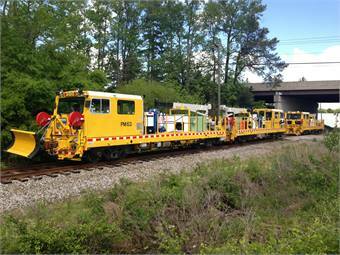 Plasser’s Dynamic Track Stabilizer is a machine that generally follows behind tamping machines. During the tamping process, the track is being lifted to correct the track geometry, which loosens the ballast underneath it. The Dynamic Track Stabilizer is designed to apply controlled, accurate stabilizing forces into the track structure at continuous speeds of up to one mph. The stabilizer is used to settle the disturbed track and consolidate the ballast again, which gives the track a higher lateral resistance. This is especially important for reducing slow orders, according to the company. Also in summertime, when the tracks heat up, you can avoid track buckling and kinks in the rail by using the stabilizer. On higher-speed lines, like Amtrak, the stabilizer can reduce slow orders quite a bit, according to Plasser.